Just wanted to submit my entry for the winter contest! THIS CONTEST IS SO EXCITING FFFFFF, I have loved all of the entries sooooo much so far, I just had to give it a shot! (I take him to college sometimes and he sits on the piano when I play in the jazz band. He's cool enough for jazz! Because he's an ice type! Hunh? Hunh!?). Anyways, I hope you all are enjoying your holidays, and a Happy Belated New Years to all! Hey guys! I recently came into some neato new shelving, and haven't done a full-on collection update with everything I have in quite a long time! I figure it's probably time, since everything is all displayed nicely so I can take pictures super easy :3 I also have a couple of customs for sale! Particularly an Espeon and a Shiny Flaaffy~ Aaand, I've decided to open up commissions fully! in-case figure gb payment 1 + wants! 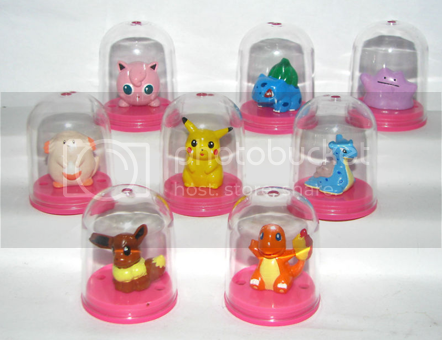 Also, I'm still on the hunt for CharaBottlins aka Bottle Figures! Pencil Topper, and Latios Bean Auctions, Sales and Looking for Cards! Settled in... Re-introduction.. Wants... Customs! Finally settled into a new apartment + new sewing machine! This means.. more collecting and customs! POKEMON STAMPS/STATIONARY-- What do you have?! Expected completion for all commissions: February 15-20th. So, it's been about 7 months since I last posted here. Anyway, I'd just like to share some of the items I got since I last posted here. So, follow the magical cut to see some new plushies and stuff! Here's my collection site for those interested http://fountainofdarkness.weebly.com/ Please visit!! Reasonable price please, *'s means i want them the most. Looking for metal figures & marbles. Arcanine and Growlithe, specifically. I currently do not own any keshimon, so any colors that exist would be fabulous. If you have any that you're willing to sell or would be able to point me in the right direction, I'd be very happy. I have no idea what these are worth so I guess it comes down to how much you'd be willing to part with them for. As for marbles, I have yellow and light blue Arcanine marbles and one light blue Growlithe marble with a star on it, as well as the Arcanine magnifying marble case thingy with some non-firepup marbles that came with it, so I'd be interested in purchasing any other colors that anybody is willing to part with. All the marbles I've bought so far have been around $1-3 apiece, but if you're looking for more try me. .-. whewwww we did it! and you still have some time before the 24 hour limit cut off to make it into golden ticket promotion DEADLINE IS UP!! there's roughly 160 people in the competition! good luck to all! details and payment info here! the line was three times as big, since this time they did it on a saturday, not a weekday. go back to weekdays!!! after we left the line to get into the center was an 1.5+ hours long. I will eventually have a collection update. Once I put things back on shelves and get a new camera. But for now, have some sales with phone pics! 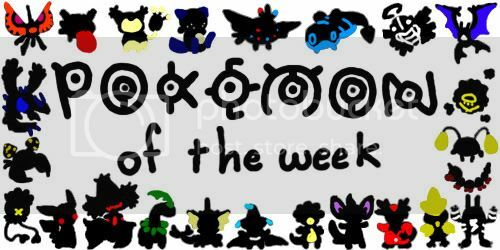 Featured: Reverse Holo Kyurem, Full art Terrakion, Mew Prime, Victinis, and reduced prices on some cards! Featured: Custom Lumineon plush, Victini/Hydreigon mini card binder, Victini deck box, Muk 151 badge, cheap things! That's a lot of neat stuff I would like out of here, so go look! Hey everyone! I know you're all sick of me, but my friend really cannot use livejournal. No, really. ...and she wants some stuff! She would rather not spend over $30 at this point! Thanks for helping me and my friend out here! I'm thinking about putting the other three up for auction and was wondering how much they are worth before I do. Putting the elemental birdies up for offers - but not now. I may or may not be busy in the upcoming one or two weeks. I may try to get an offers post up before then, though. Now my question involves shipping. I've decided that even if it'll make my shipping times a bit slower, I'm only going to be shipping things from a Post Office from now on. I do want to start shipping internationally because I do feel bad turning people away. Is there somewhere where I can get a bunch of customs forms? I hate having to asking for them individually at the counter and then filling them out there holding up the line. After I get some, I'll start to try shipping internationally. (I will still have some conditions to this, but we'll save that for another post. )Answers are appreciated, thanks everyone! Answered! Thanks to everyone who answered! Hello all! 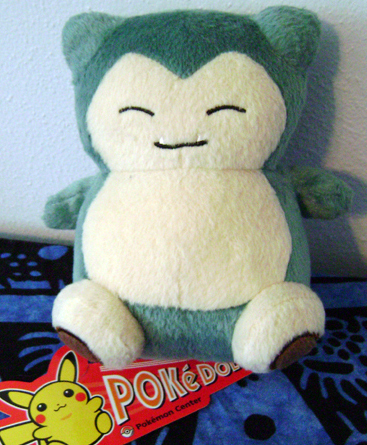 I just have a question on the identification of this plush I saw on eBay. My first instinct was to check PokePlushProject, but while I saw a similar Mew there, this is quite obviously an American release, if you observe the packaging. 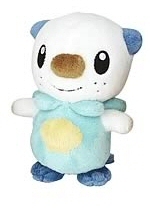 Anybody have any idea on what this Mew plush is exactly? IDENTIFIED! 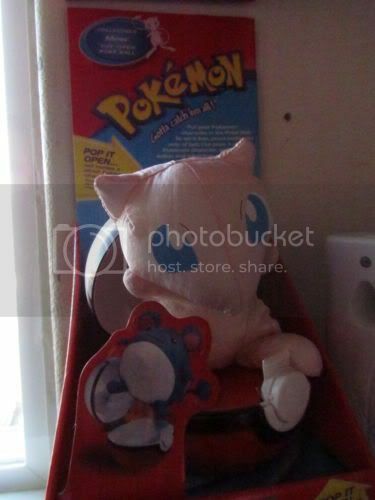 It's a taffeta Mew plush made by Hasbro. 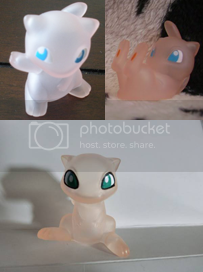 Oh, and I'm currently looking for Clear Mew Kids pics to add to my Pokemon merch wishlist. Does anyone have any to share (if they don't mind that is ^^;)? It's been a long time since I've been active here, so I'm sure many of our newer members haven't seen me before. My name is Kate, I and I predominantly collect Walrein. I'm planning on selling my Shiny Entei pokedoll, but I'm not exactly sure how much it's worth/ how many people would be interested. For those of you that weren't around for the promotion, about 150-250 Pokedolls of each shiny beast were given away in a Pokemon Center lottery (more info can be found in this video). I don't have a picture of my own (my collection is currently 300 miles away), but besides the hang tag being unattached, it's in almost brand new condition. The tag is currently in my possession, also. 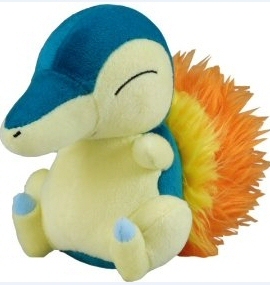 I would be willing to do a partial trade for a Pokemon Time Wailord plush, if anyone is interested in that. Here they are, all comfy cuddly on top of my printer in my dorm. 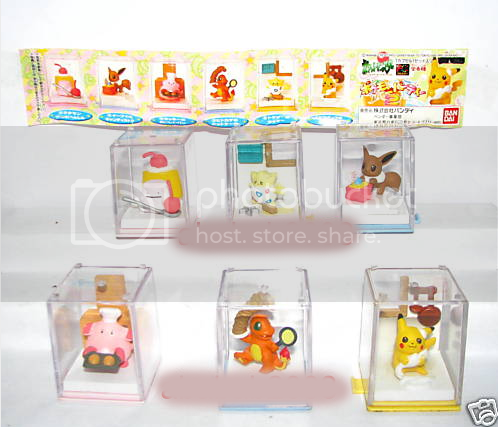 Also, let me know if you are selling the I<3Pikachu series line and have pics/prices. I'm looking to possibly buy more from that line as well. I was dusting my shelves today and couldn't help noticing my oddballs. I really only collect one Pokemon, but I have random pieces here and there of things I picked up just because they looked neat. 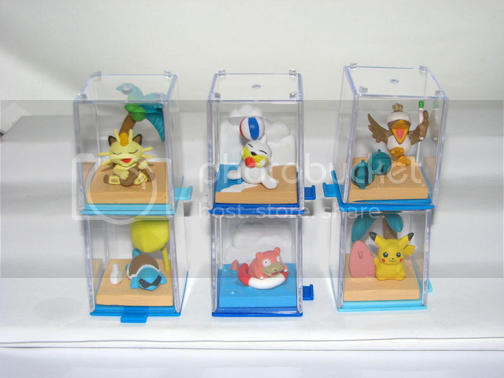 -Like my Ho-Oh Pokedoll, giant Jakks Dialga, Pichu Cereal Bowl hanger, and squishy Lure/Ultra/Master Ball stress balls. Now, I know I can't possibly be the only one... So let's show off our oddballs! Post pictures of your favorite things in your collection that are from Pokemon you don't actually collect. Things that you would probably never sell/trade and that you just love for whatever reason. These four figures came from a capsule machine in a bowling alley in Marietta, Georgia. I have no idea how they came to be there, when they were released in America, or why they had stuff from Orange Islands when Advanced Challenge was playing in the states, but they're super neat! I was so thrilled to get both Joy and Jenny, since they've always been favorites of mine. MPC set D GA payment needed! Hi Guys! 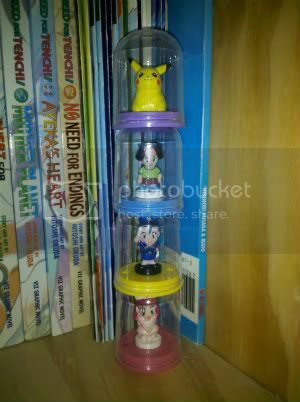 I've updated my sales thread with a used Worlds 2008 binder plus new DX Pokedolls at Nintendo World. 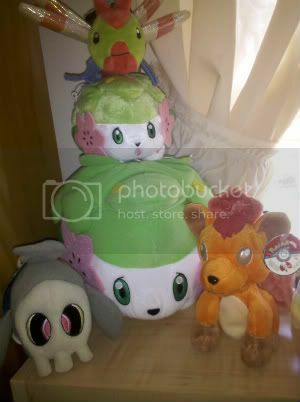 I still have pokedolls and Worlds Promotional cards for sale. Remember all items are negotiable! Reminder for 'Big Penguin Plush GA'! Check the auctions here. Some plushies are still on their starting bids and couple that don't have any bids! Get bidding. I also need some final payments for #1 Eeveelution charm GB, so I can ship them next week. See the shipping costs in here. And #3 Eeveelution charm GB still needs claims for Eevee and Glaceon! Get them while there still here! Check them here. Also I went to a con which happened to be in my hometown this weekend called Desucon Frostbite. I found very unsual plush I didn't think ever to get! It's sunday and you know what that means!! Cross your fingers for your favorites, let's fire up that randomizer! !